Missouri's Hawley Has The Money In GOP Senate Primary, But Will He Get The Votes? 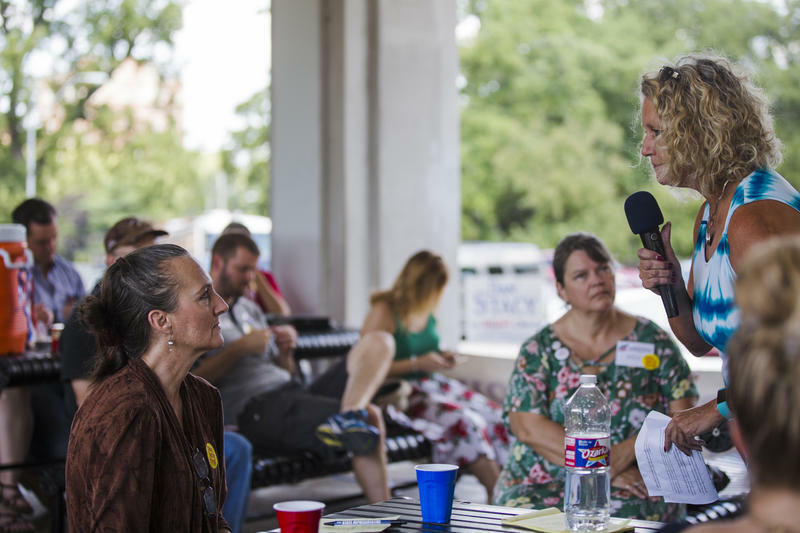 Penny Monetti (right) spoke on behalf of her husband, U.S. Senate candidate Tony Monetti, at the Jackson County Republican Party's ice cream social July 15 in Kansas City. She touted former vice presidential candidate Sarah Palin's endorsement of Monetti. 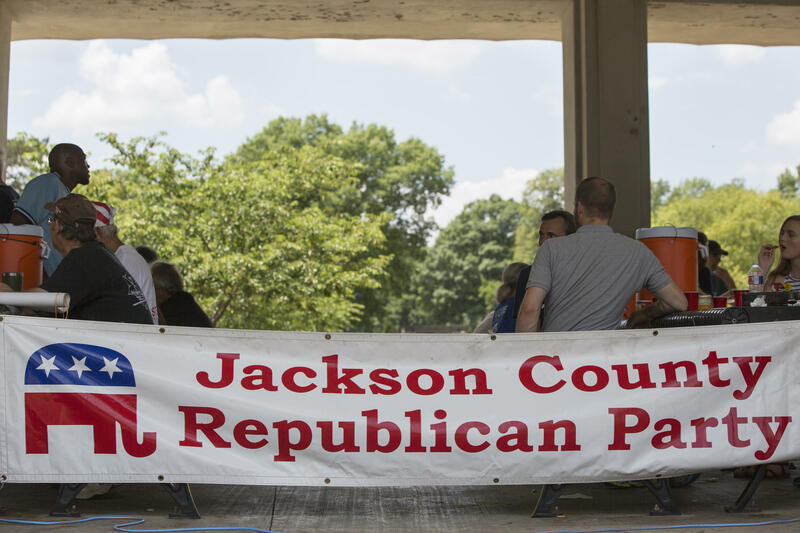 The Jackson County Republican ice cream social drew only a couple dozen Republican voters on July 15. But all of them wore yellow “Claire... you’re fired!” stickers. County party chairman Mark Anthony Jones called up the contenders for the GOP U.S. Senate nomination one by one, though one key person was missing: the front-runner, Missouri Attorney General Josh Hawley. “Anybody here from the Josh Hawley campaign, because it’s your turn,” Anthony Jones said at Loose Park in Kansas City. Missouri Attorney General Josh Hawley has more money and more name recognition than the other candidates for the Republican nomination for U.S. Senate. The primary election is Aug. 7. But to county GOP vice chair Jennifer Finch, it’s part of a larger trend of the establishment’s handpicked candidate passing on local events. And it’s something she and others say is making it hard for Hawley to earn the trust of voters ahead of the Aug. 7 primary. “We have a little game statewide called ‘Where's Josh’? Kind of like Where's Waldo. Josh is only showing up to the things that are pre-scripted and pre-approved,” Finch said. Hawley supporters say there’s a good reason he’s not always at events — he’s busy being the state’s top legal officer. 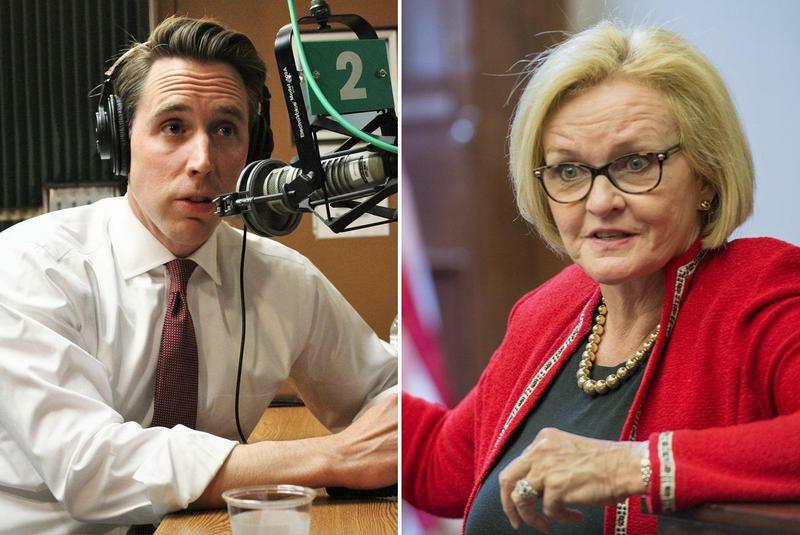 Plus, Hawley has outraised his competitors and is largely expected to secure the nomination to take on Democratic Sen. Claire McCaskill in the fall midterm election. Finch plans to vote for Hawley, but only if he’s successful in August. “I fear that he will not support Donald Trump. But I know Claire McCaskill doesn't. So it's worth it to me to take that shot ...” Finch said. Republican Voters In Missouri Weigh In On Primary Senate Race from KCUR 89.3 on Vimeo. Hawley has the endorsement of President Donald Trump, who campaigned on his behalf in Kansas City on Tuesday, headlining a $1,000-a-plate luncheon fundraiser. Ten other Republicans are vying for the nomination, including Tony Monetti, a former B-2 stealth pilot, and former libertarian Austin Petersen. They’ve raised the most among Hawley’s challengers, but the less than $50,000 each candidate has on hand, according to the most recent Federal Election Commission filings, pales in comparison to Hawley’s $3 million cash. “I guess you would say that if I win this primary nomination, it will be a grand upset for sure,” Petersen told KCUR in an interview earlier this month. He’s running on a platform to reduce government spending, lower taxes and reform immigration. 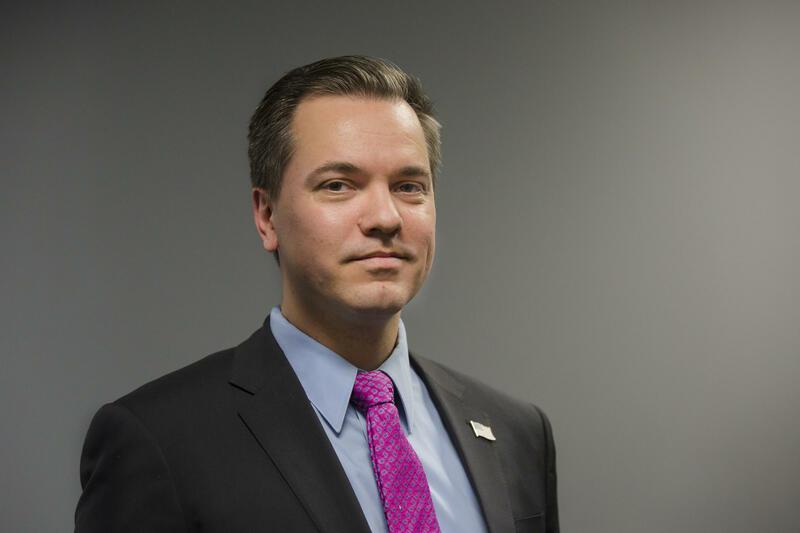 Republican U.S. Senate candidate Austin Petersen. Meanwhile, Monetti, who wants to improve mental health care for veterans, also acknowledges that he’s outmatched monetarily. But he said he hopes his message will resonate more with voters. “The people are tired of politics as usual. They want to give a veteran, a combat vet, a businessman a chance rather than the establishment. We're tired of ladder-climbers,” Monetti said, referring to Hawley’s 2016 ad for attorney general. That was Hawley’s first race for a statewide office, one in which he received the most votes of any candidate in Missouri, including Trump and former Gov. Eric Greitens. Plus, Hawley was able to say he wasn’t a career politician — something that’s important to Platte County GOP chairman Jim Rooney. “I thought he would make a great attorney general. I would have hoped that he would have maybe stayed as the attorney general but because he had run statewide and won, I think that’s why a lot of people pushed him to run for the U.S. Senate,” Rooney said. Hawley’s current job looms large in the race. It’s one of the reasons why Nola Wood of Kansas City is voting for him. She said she likes what he’s done in office, as well as his stance against abortion rights. Woods said she understood why Hawley didn’t join the other candidates — or send a surrogate — to the ice cream social. Republicans gathered in the mid-July heat to hear Republican contenders for the statewide races speak at the Jackson County Republican Party's ice cream social at Loose Park in Kansas City. “A statewide campaign is a huge, huge endeavor if you had nothing else to do and he's the attorney general of Missouri,” Wood said. For Josh Hurlbert, Hawley’s election as attorney general is proof that he is the best candidate to run against McCaskill. “I think Hawley has the best mix of actual name ID and fundraising capability,” he said. These stickers ("Claire ... you're fired!") were given out at the Jackson County Republican Party's ice cream social. But for other Republican voters, Hawley’s investigation into allegations that Greitens’ charity skirted campaign finance laws made them question voting for him in this primary. Monetti campaign volunteer Karen Raidy said she didn’t like how Greitens was treated. 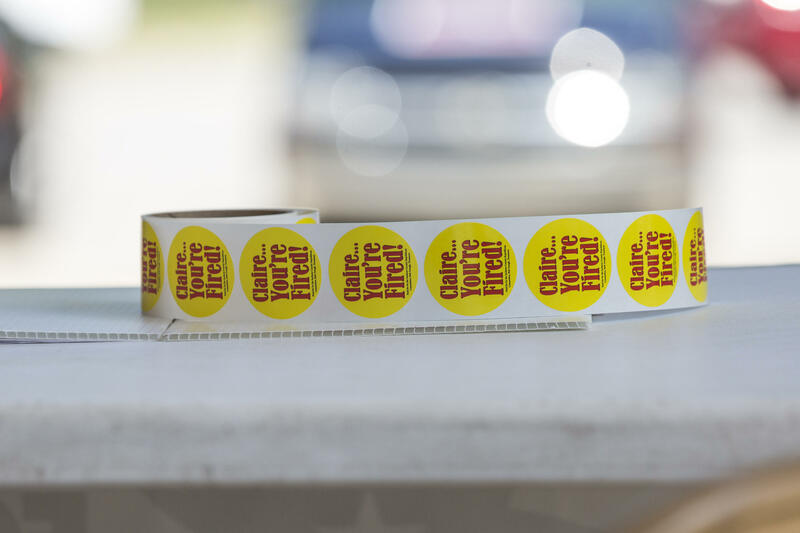 Less than two weeks before the primary, Rooney said he’s still undecided; “I might not make (a decision) until I walk into the booth.” His red 2004 Ford Ranger is decorated with political stickers —including one from Hawley’s attorney general race. He’s considering for Hawley in the primary, but he’s not sure yet. There’s one thing he’s looking to see. “It’s the Show-Me State, so you got to show me that you really want the job,” Rooney said. This story has been updated to show that Petersen is running as a Republican, not a Libertarian. After the resignation of Missouri Gov. Eric Greitens on Tuesday, months of turmoil in Jefferson City might finally be coming to an end. And Republicans such as Attorney General Josh Hawley are eager to shift focus to ousting the state's top Democrat in this year's midterm elections. 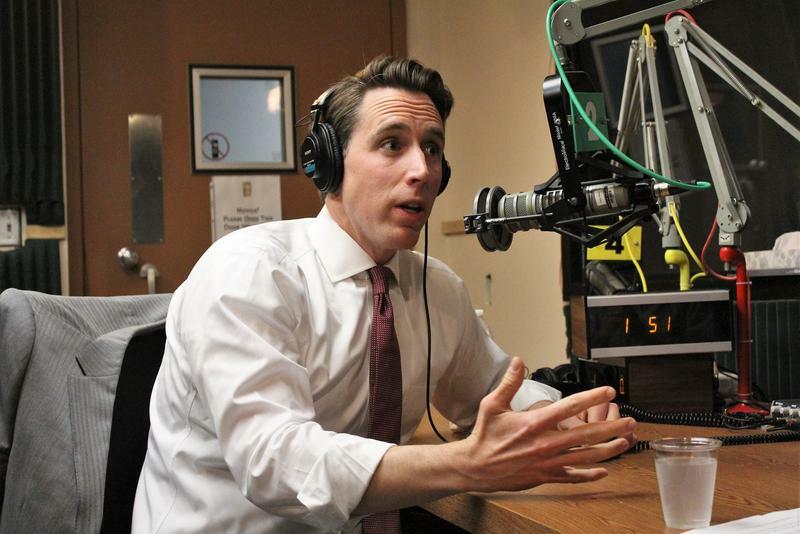 On Thursday afternoon, Hawley sat down with KCUR's Up To Date to discuss the historic resignation, his role in prosecuting the governor's alleged misdeeds, and, especially, the record of U.S. Sen. Claire McCaskill.